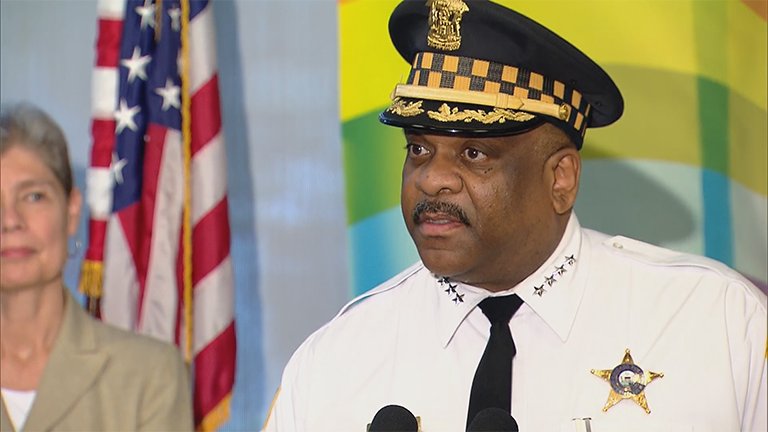 Chicago Police Superintendent Eddie Johnson speaks about increased security measures for next weekend's Chicago Pride Parade. Chicago's annual Pride Parade is a time for celebrating the LGBTQ community. On Thursday, city officials and law enforcement said they want the revelry to continue this year but announced additional security measures in the wake of the mass shooting in Orlando that left 49 people dead and more than 50 injured when a gunman opened fire at a popular gay nightclub. “We all know that there’s a lot of focus on these events, given the horrific incident that occurred in Orlando earlier this week. I want to take this opportunity to repeat what we know and we have been saying: There is no intelligence or threat against the LGBTQ community or any event in the city of Chicago,” Chicago Police Superintendent Eddie Johnson said. The city is always “prepared extensively” for the Pride Parade, said Richard Guidice, deputy managing director for the city of Chicago Office of Emergency Management and Communications. This year, law enforcement has built upon its existing plan in light of Sunday's mass shooting in Orlando. Additional measures will include more police officers and private security, the opening of the emergency operations center, reducing the number of entries into the parade from 215 to 160, and increased barricades along the parade route. While law enforcement officials stressed the importance of safety and urged attendees to report suspicious behavior to the police, Ald. Tom Tunney (44th Ward) said parade-goers should also be respectful. The 47th annual Chicago Pride Parade is scheduled to step off at noon on June 26 at the intersection of Montrose Avenue and Broadway in Uptown. More information, including a parade route map, is available on the event website. June 15: As Chicago remembers victims of the Orlando nightclub shooting, it's also preparing to celebrate Gay Pride Month over the next two weekends. Hear details from the parade coordinator. June 14: Members of Chicago's Muslim and LGBTQ communities are grappling with the fallout from Sunday's attack at Pulse, a popular gay nightclub in Orlando that left a reported 49 dead and 53 injured. We speak with a local Muslim interfaith youth leader and a former employee of Pulse. June 13: Chicago reacts to the mass shooting in Orlando that left a reported 49 dead. We have the latest as a vigil gets underway in Lakeview.